Two more days to go for the J&M birthday offer. From now until J&M’s 13th birthday on Friday 23rd, anyone becoming a $4 per month patron (or raising their existing pledge to $4) gets sent a signed, dedicated A5 J&M print of their choice, on top of the usual $4 rewards. Say which comic and who you want it dedicated to in an email or Patreon message. This is a limited time offer. ray, maybe add… comment section contributors ???? Author: Yesterday, Wednesday, I could not access the comments section. I tried going to “previous” and back to “last”, but it made no difference. Today, I was able to get to “comments” but still only by going to “previous” and “last”. Sorry, Son of Glenner. I have no idea why that happened, and I can’t replicate the problem. Usually you can access the comments by clicking on the red title. It’s possible that your browser is glitchy. Have you tried using a different one? It happened to me, too. (Safari, MacOS). 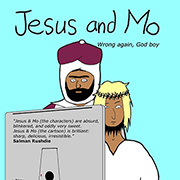 I had to click on the link in the email (http://www.jesusandmo.net/comic/born/) to get back here. In fact, http://www.jesusandmo.net is still not working. Not in Firefox, either. The comic comes up, but not the comments. Ctrl and F5 seems to sort it. The surety of religious numpties and the respect that is expected by society for what are clearly delusional ideas is the cause. 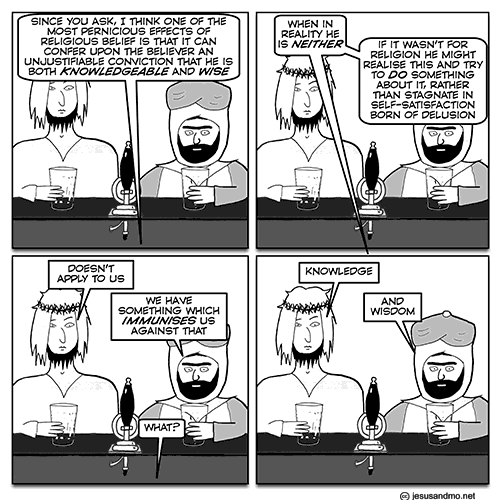 Religious people should be ridiculed in the streets and their beliefs questioned every time they spout their shite…. oake: Thanks for the tip. The problem seems to have resolved itself now, but I’ll try Ctrl and F5 if it happens again. I normally use Safari, with Firefox available as an alternative. Oh for the days of my youth, when written communication was per pencil or steel nibbed pen dipped in ink in an inkwell! At least it was on paper, not goatskin parchment! M27Holts: Re your first comment: The expectation of respect for religious delusions is a legacy from when the religious were a dominant majority. It will take several generations before this legacy dies out and religious believers will be given the kindly treatment and medication they need. Re your second comment: Encouraging people to have burglar alarms and good locks on their doors is not the same as condoning burglary. In the same way, criticism of the work of the security services is not the same as letting Islam off the hook. BTW, pointing out difficulties in accessing these comments is in no way a criticism of our esteemed and no doubt hardworking Author. I smell religious viruses or trolls in the system, if that is not too paranoid. The good old self-satisfaction… Personally, I prefer admitting that I don’t know something than having the false certainty of a made-up answer. In fact I know so little, i don’t even know what I don’t know! My daughter translated the Socratian Greek as “All that I know is that I know nothing”. M27Holts: Coincidentally, I’ve just had (yesterday, Saturday) a really great day, in which several different kinds of beer played a major part, with a tiny bit of assistance from single malt Scotch whisky and some chips (“fries” to you Yanks & Kanucks). And I don’t even have a hangover! Where is everybody? What site are they bantering on? M27Holts: Looks as though you and I have killed this discussion with our remarks about beer and related matters! I thought that beer makes for good company and good times…always drink in a good mood and avoid if you depressed….free advice from the northwest sector of Mancunia…. M27Hols and Son of Glenner, I’m here but I’m being quiet. Just lurking in the snug nursing a glass of Bells, the scotch of British journalists and Scotland Yard. That’s because I have nothing to contribute to the conversation at the moment. But please carry on.